This website brings together resources from a conference supported by the Spencer Foundation at Arizona State University where an interdisciplinary group of older and younger scholars gathered to document and illustrate the basic patterns of visual and auditory attention that are employed by researchers who use video to study social interaction. The image below shows some of these scholars conducting individual analysis of a 2-minute video of classroom interaction showing the teaching of a key idea in the physics of matter—that matter occupies space—in a bilingual kindergarten-first grade classroom. Recordings of these Individual Viewing Sessions comprise one section of this website. 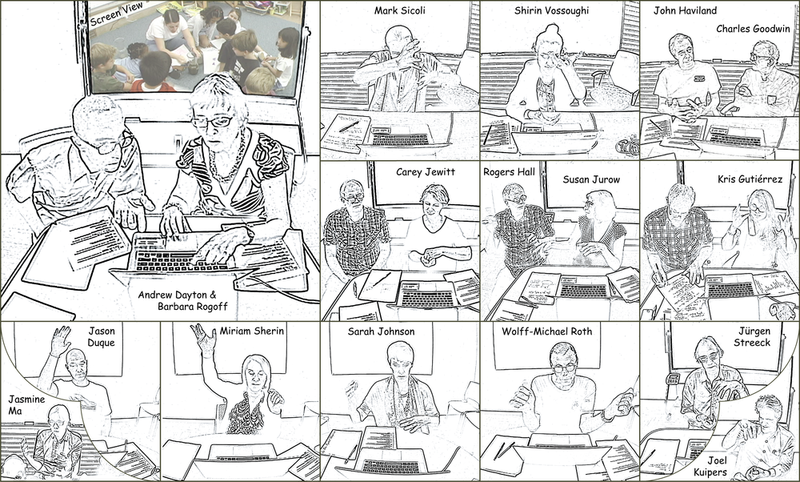 Other sections include a Group Viewing Session, which has a recording of all scholars conducting a collaborative viewing and discussion of the same 2 minute video they watched in their individual viewing sessions, Presentations, which showcases videos of researchers describing how they use video-based analysis in their past and current research, and Future Directions, which includes video from a group discussion and a written summary of themes outlining key issues, needs, and future directions for video-based analysis in education and the social sciences. We suggest you begin exploring this website by reading the following: Conference Overview, Conference Proposal & Conference Participants. Additionally, in the group viewing session section, conference organizer Frederick Erickson provides an introduction to the purposes and goals of this conference and work. All material on this website is covered by a Creative Commons Attribution-Non Commercial-Share Alike 3.0 Unported License. Lastly, we would like to thank the Spencer Foundation for their generous support of this work as well as Arizona State University for hosting the conference summarized in this website.